Happy Friday, friends! This week has flown by and we are so excited for some quiet time this weekend. I'm going to share a few of our FAVORITES from the week and if you'd like to join me, Erika and Narci in sharing you can add your link at the bottom of this post. First up on my list is No Such Thing - one of the CUTEST Halloween books EVER! I ordered it a while ago and it came in last week and we can't stop reading it! The illustrations are so cute and the story is simple and fun. It's been our FAVORITE this week and I'm going to have a hard time putting this one away at the end of the month. 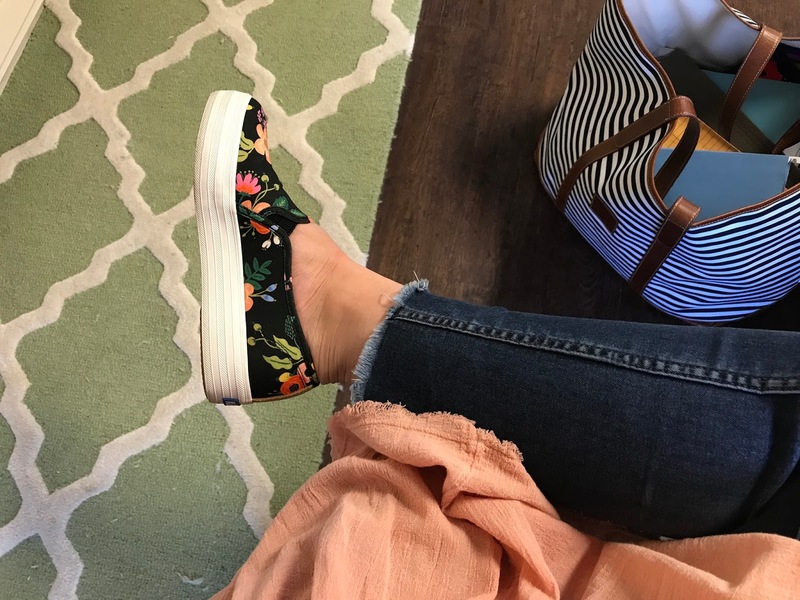 Several of y'all have noticed and asked me about my new moccasins and I was hesitant to give too much information until I tried them out and made sure I really liked them and the verdict is in and they're the comfiest moccs EVER! I even wore them all day at the fair last weekend and they were PERFECT! These lopsided piggies and rumpled after-school-look are signs of a great day and my FAVORITES! It's been cooling off here at night and I finally got to break out this AHHH-MAZING poncho! I'm in the XS/S and it's almost too big but I absolutely adore it. It's the most comfortable thing in my closet and is a great length that I'll be able to wear to school with leggings. The inside is pretty much the softest blanket you've ever felt and I want to live in it. :) It comes in several other great colors (I grabbed mine during the anniversary sale and this was the only color available in my size) and I'm seriously eyeing the gray. You can click HERE to check it out! Sunrise/sunset pics are my FAVORITE and never get old for me. Luke snapped this one on our way to school yesterday and I must have looked at it a dozen times because HOW AWESOME is God to make something so gorgeous?!?! Yesterday afternoon I got to stop in at the middle school football game. Getting to see my students do their thing outside of the classroom is my FAVORITE! This sweet boy (who looks like he has freckles but actually is covered in sand) makes me proud every day but I may have been a little extra proud when he told me that he made the Math Olympics Team this week. I'm secretly WAY excited about helping him get ready! And last, but not least, my FAVORITE art from the week was Mason's "never-ending pizza slice and balloons that never pop". Please note that he "framed it like it was hanging in a museum". Have a WONDERFUL day and a fantastic weekend, friends!!! I need your messy bun skills! Seriously amazing! Wahoo for the Math Olympics team!! Those selfies are my FAVORITE!!! If I had that blanket poncho that soft, I'm pretty sure I'd never wear anything else. Ha! I think you're spot on about building rapport with your students. I can still remember the teachers who would stop by our games. It was so fun to show them what else I worked on (outside of the classroom). Aw!! Those selfies are precious!! And, way to go Luke!!! I love your moccs! And those selfies are the best! Happy Friday! Love that blush hoodie so much! And your selfies made me lol! Poor G! Motion really gets to her! I love all the pics - you are such a fun mom! I always thought I was the only person that gets motion sickness on swings!!! Poor GG! I ordered that Ugg poncho and loved it, but even the XS was way to big. I looked ridiculous in it. I want that Free People hoodie, but my size is already gone in that too. So GG is Mason with long hair. I never saw it as much as in these silly pics. Cute! Happy weekend!